My little brother’s exasperation with/at goat cheese is the stuff that family jokes and big-sister-harassment are made of. But I still love him. And even though my mom didn’t exactly produce the most wilderness-worthy children – I don’t think I’ve voluntarily spent a night without electricity in my life – I’m extremely confident that he would die of dysentery LONG before I would. But he might adapt. As a gun person, he could be useful. If properly motivated, he could switch from picking empty Bud Light (SERIOUSLY, HOW ARE WE EVEN RELATED?!) cans off of a fence post to bagging us a deer or something. Because milking a goat (or the fact that one can milk a goat) would never cross his mind. Let’s just hope we never have to find out. While he possibly tried to give me the silent treatment, I spent the next several minutes fielding recipe questions and compliments. Because the peppers were gone inside 30 minutes. And it’s no wonder. 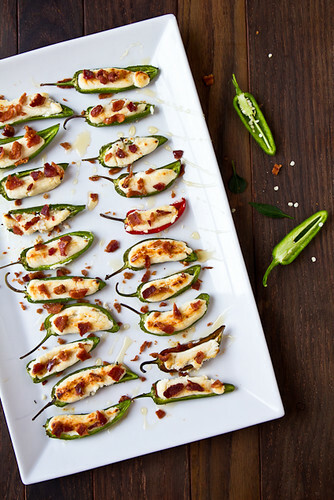 The jalapeno popper itself is pretty awesome. It’s only downside is the bacon-wrapped version doesn’t get crispy enough. And we’re extra-crispy-bacon people. Like, so crispy it should shatter when I look at it. So we improved a bit on the jalapeno popper: I used up some of the 108 (!) 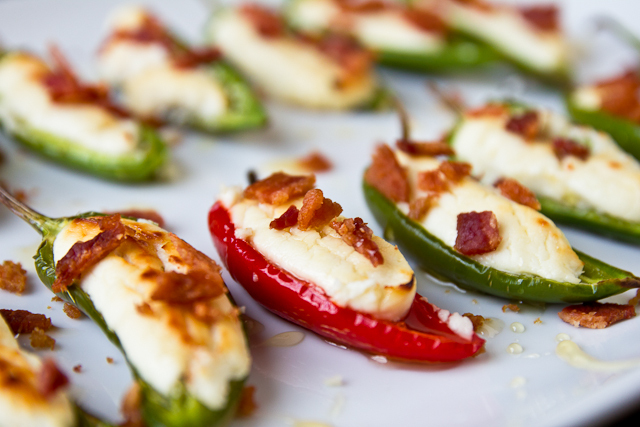 serrano peppers that I picked from the garden last week, went the “DIY honeyed goat cheese” route, threw in some leftover cream cheese for good measure, and then topped it with some crumbled so-crispy-it-shatters bacon. The combination of Sweet + Tangy + Salty + Heat is insanely addicting. I bet you can’t eat just 6! Unless you were late to the party. And then you couldn’t even eat one. Because the goat cheese hater ate yours. 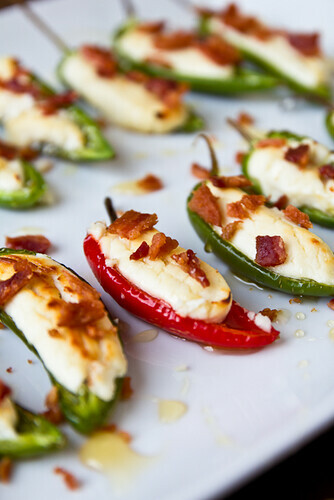 The jalapeno popper gets a simple makeover with the addicting combination of goat cheese, honey, and crispy bacon. Preheat oven to 425 and line a baking sheet with foil. 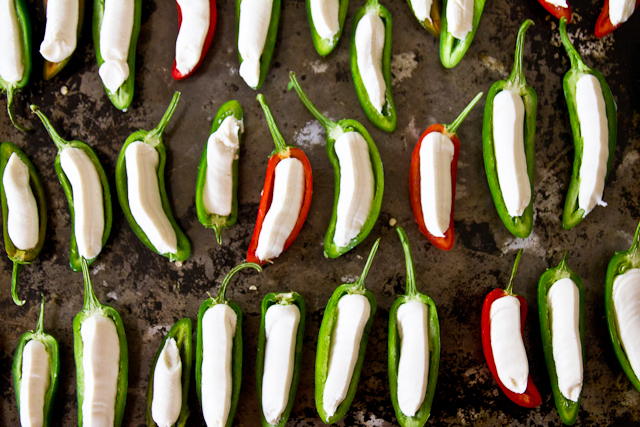 Place the peppers onto the baking sheet - if you have any wobbly peppers, cut a sliver off the pepper, creating a flat surface on the bottom. In a medium bowl, place the goat cheese and cream cheese in a bowl and microwave for 20-30 seconds, until softened. Add honey and salt and stir until combined and smooth. Transfer the mixture to the bottom corner of a large zip-top bag, snip the corner off, and pipe the filling into the peppers. Bake for 10 minutes and then turn the broiler on for 1-2 minutes. Remove from the oven and let cool a few minutes - if you had any peppers roll in the oven and lose their filling, use a spoon to put it back in place. Transfer the peppers to a platter, lightly drizzle a little honey over the peppers, and then crumble the bacon over top. Enjoy immensely. Warm or at room temp. Or cold. You can't go wrong. I love surprising my brother like that…it’s the stuff that my dreams and his nightmares are made of! I don’t think he has a vendetta against goat cheese though, which is unfortunate because it means I MIGHT have to share! Oh my gosh. These look delicious!! I’m going to have to make them soon! I have no doubt they are amazing! Oh man, do these look insanely good. Lucky for me, all my friends looooooove goat cheese. Guess I know what I’ll be making for one of appetizers during our week in South Carolina! These look so great! And cheers to goat cheese!!! Man are you funny, Shawnda! Your brother sounds like a hoot, haha. If he enjoyed these I think you could get just about any man to love ’em! I know we would! I made these with chorizo instead of bacon, and hot damn, they were delicious. Thanks for a GREAT jumping off point! Since I am lactose intolerant could I omit the cream cheese and just go with the goat cheese? Sure. The cream cheese is minimal – it does contribute flavor and is meant to help make the filling creamier. I am planning on making these for thanksgiving. Will crumbled goat cheese work instead of the log? I’m sure it will be fine – the soft goat cheese and cream cheese together make a nice, smooth, pipable filling. I’ve been looking for an alternative to plain old poppers, which are great, but come on, these have GOT to be phenomenal! I am going to make them to take to a New Years Eve party. I made these, they were very very delicious! Definitely adding them to my repertoire. Could you make a bunch of these and freeze for later use? These are sooooo amazing. I make them all the time, and like you said, they disappear! This looks very good. 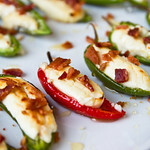 I am thinking of trying this with mini sweet peppers. My neighbor makes a goat cheese dip that is to die for. Fantastic! There are lots of jalapeños in the garden right now, and this will help me use them up and also give me an excuse have a little party with beer, wine and appetizers.